Lovin' Lyrics Music Promotions: MATT STILLWELL IS ON THE FAST TRACK WITH KEVIN HARVICK, INC.
MATT STILLWELL IS ON THE FAST TRACK WITH KEVIN HARVICK, INC.
Nashville, Tenn. (October 14, 2013) — Country music recording artist Matt Stillwell and Kevin Harvick Inc. (KHI) have announced a partnership that will help drive growth and innovation in the area of corporate sponsorship and branding. Stillwell is the first music client signed to the KHI roster primarily consisting of auto racing and professional athlete management. Under the agreement, KHI plans to use their extensive experience through their NASCAR relationships and cohesively extend them into the country music genre. 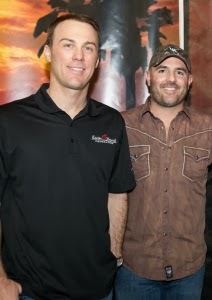 Stillwell adds, "I am more than excited to be a part of what Kevin and DeLana Harvick are doing. They are great people. The possibilities are endless and I am pumped to be moving forward with KHI." Matt Stillwell broke into the country music scene with his single “Shine” debuting at #25 on iTunes country chart and the accompanying music video reaching #5 on CMT Pure and breaking into the Top 10 on GAC's Top 20 Country Countdown. Stillwell has been touring in his custom wrapped bus called "The Mule" across the country headlining his own shows, as well as opening for country superstars such as Dierks Bentley, Jason Aldean, Gloriana, Luke Bryan, Blake Shelton and performing at huge music festivals like Country Thunder. Stillwell is managed by Rusted Truck Ranch. Plans for a new album release are currently in the works. For more information, please visit www.mattstillwell.net.